October 2016 | Ben, Heather and I put together a fun Oktoberfest this year. Ben and I had about ten beers between us and a few others brought 1 or 2 beers. 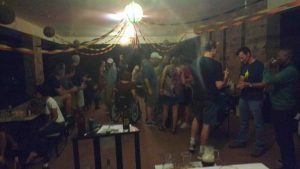 We had lots of fun games and a pot luck featuring lots of German food. 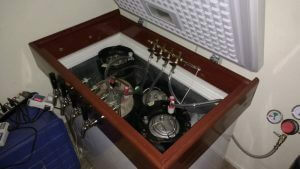 Ben and I dragged my 4 tap draft system down to the pavalion. October 2016 | I’m very excited about my new keezer- a freezer with 4 taps on it. I’m still working out the kinks. September 2016 | Brewing a triple batch with Ben and Tom. 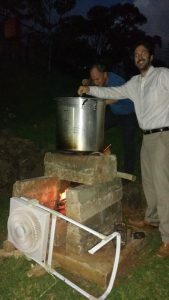 Ben bought a 100 liter brew pot, which was then too big to fit on the stove! So, he also built a big food fired outdoor fire pit to get it boiling. A fun day brewing. My favorite blog is the brulosopher.com. On that blog, the author (Marshall Schott) and friends of his run experiments on variables in their brewing to see what makes a difference. I love the combination of statistics and brewing! In the spirit of that blog. 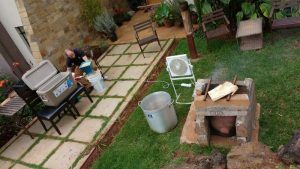 I ran an ‘exbeeriment’ this weekend. 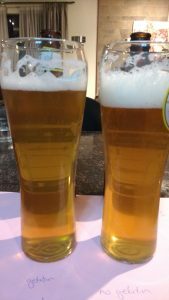 Exbeeriment 2: May 2016 I brewed a batch of Pilsner and split it into 2. I fined half the batch with Gelatin and did not fine the other half (though I did cold crash it). Both beers turned out pretty clear, though the gelatin one was a bit clearer (the beer on the left) , at least at 1 week. I did not collect any data on this exbeeriment, as I was mostly interested in my own opinion about the clarity. Exbeeriment 1: August 24 2016. I brewed a batch of Dry Irish Stout. I wanted to test the effect of storing it in a fridge vs storing it at room temperature. I had 25 respondents, 9 of whom correctly identified the cold stored beer out of 3 samples (they did not know the variable). However, this results has a p-value of 0.3886 and is not statistically significant. So, it seems unlikely that storing beer in the fridge or at room temperature causes any significant difference. However, I only had 25 results and need 30 to meet the conditions of the test – I’ll have to make sure I get more responses in the future!